A camp that began as an introduction to lifeguarding for kids too young to participate in our Junior Lifeguard program has now transformed into something much different. 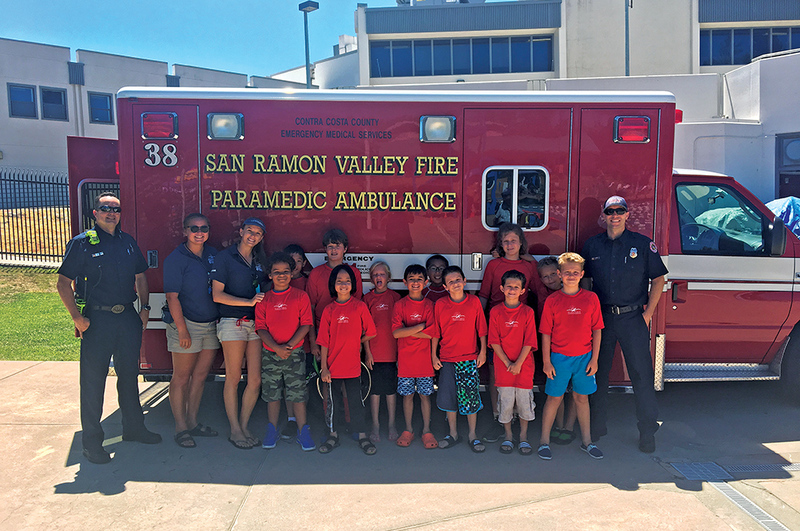 During a winter brainstorming session, a staff member said, “Let’s create a camp where kids just have fun at the pool,” which became the new focus for the city of San Ramon’s Star Guard Aquatic Camp in California. After many years of successfully operating under the previous format, participation was declining; it was time to mix things up. A camp heavily focused on lifeguarding skills seemed a bit rigid for 9 to 12-year-olds trying to squeeze every ounce of fun and freedom from their summer break. A camp that focuses on activities, crafts, and games—all taking place at the pool—sounded more in line with customers’ needs. A camp that is based on unique weekly themes with tailored activities sounded like even more fun! While we had a strong desire to pump up the fun factor to revive the stale Star Guard Camp, staff members still wanted to incorporate some of the lifeguard training elements from the previous camp. This made the weekly theme concept critical, as this would allow us to teach skills through fun activities. Some of the great themes that drove success this past summer were Super Heroes, Under the Sea, and Journey to Outer Space. The final key to revamping this camp was to strategically market the revised program; with all of these elements in place, we were able to increase participation by 69 percent since 2015. The first step is to create a weekly template that is followed each week, regardless of the themes selected. Identify the common activities and skills that you wish to repeat each week and add them to the template. This will allow you to identify the remaining time available to fill with activities, crafts, and games geared towards the selected theme. These will be the only items that change each week after the initial template is created, making planning for future summers much easier. The template also serves as a useful tool for reserving pool, field, and classroom facilities, since this often takes place well in advance of having the specific details of the camp worked out. The next step is to pick themes for the summer. There are a lot of possibilities for themes and not all themes have to be aquatic-related, like Mad Scientists and Journey to Outer Space. Although unique and successful, they still did not create as much excitement as the Super Heroes theme, which has made an appearance the past two seasons due to popular demand. With a new superhero movie coming out every summer, this theme has endless possibilities. Other ways to select themes can be through engaging staff. Have staff members submit and vote on their ideas or simply pick themes that coincide with a popular trend or seasonal event, like the Olympics. Tying the theme into a coinciding event hosted by our department is also a great way to bridge the two programs and create some excitement. The Under the Sea theme was the same week as our Dive N Movie event at our pool, which was by no coincidence The Little Mermaid. At the end of the day, themes should be relevant and engaging for participants and staff members. Now it is time to plan out the specific activities, crafts, and games to match the descriptions and themes that are selected. These, along with the aquaticskill activities that take place every week, will round out the weekly schedule. Since our camps take place at the pool, we place an emphasis on sun and water safety. All campers receive a rash guard, which not only provides sun protection, but also allows for campers to be easily identified inside and outside of the pool. They also receive water-safety training, basic swim instruction, and participate in recreation swim. Repeating these skills each week always ensures there is an aquatic element incorporated into the camp when non-aquatic themes are used. When aquatic themes are chosen, additional aquatic elements can easily be added to the regular water-based activities. Each day of camp incorporates at least one field, pool, and classroom activity. One of the most anticipated days of camp is the pot luck on the final day, another element that can be included each week. 1. Surf’s Up! This was certainly an easy theme to ramp up the aquatics activities. Campers decorated cardboard surfboards and also built cardboard boats that they were able to paddle across the pool. Make sure to stock up on cardboard early and buy lots of duct tape. Instead of playing the classic duck, duck, goose, campers played duck, duck, splash. Classic divingboard games were spun off into a fun game of walking the plank. To practice underwater skills, campers went on a treasure hunt (pennies on the bottom of the pool). Arts and crafts included making a paperplate sea turtle and surfboards out of clay. 2. Mad Scientists. There were a lot of scienceproject ideas that were easily incorporated into this theme. Some of the experiments included creating an egg shelter that can withstand a drop. I will never forget the day they created slime out of a glue/water mixture. This activity was highly enjoyed by campers and camp leaders alike. There were bags of slime all over the facility, a sign of a good time had by all. Other simple projects include constructing a marshmallow catapult with rubber bands and Popsicle sticks, and the classic erupting volcano using baking soda and vinegar. Once themes are selected, it is important to advertise the dates each theme will take place. Along with each theme, we found it helpful to include a brief description of activities that will be taking place each week. This information was included in all marketing materials for the program from the beginning. Descriptions created excitement around the individual themes and assisted in increasing participation. Unique descriptions promoted campers to register for multiple sessions, knowing they would have a different experience each week. Each theme had a main project to be completed each week. Camp leaders would finalize the projects several weeks before the camp started. Pictures and videos of the project were taken and used to market the program on social media. An example of this can be found in a marketing video featuring the cardboard boat staff created in preparation for the Surf’s Up! theme. The video can be viewed at: https://youtu.be/jhwkLb-wRRc. These projects, along with themespecific flyers, were showcased at the facility to generate more exposure for the camp. Additionally, staff members captured photos throughout the week which were uploaded to http://www.smugmug.com and sent to the parents at the end of the camp session. This allowed the parents to see the value of the camp and provided an opportunity to market future camps and programs. There are five sessions of the Star Guard Aquatic Camp and it is offered during the summer months. Each session meets for one week, Monday through Friday from 9 a.m. to 2 p.m. Campers have the option to participate in recreation swim after the camp and stay at the facility until 3:30 p.m. The aquatics staff members serve as the camp leaders for this program and a stafftoparticipant ratio of 1:10 is maintained. The direct costs for part-time staff salaries and supplies for the Star Guard Aquatic Camp program is $4,650 and generates $11,000 in revenue annually. Andrew Hubbard is a Recreation Supervisor for the City of San Ramon Parks and Community Services Department in California, overseeing the aquatics programs and facilities. Contact him at ahubbard@sanramon.ca.gov.